For any small business, there’s no question that efficient internal communication is key. That’s doubly true in today’s world, where many companies have team members scattered around the world. There are communication platforms out there that look to tackle this, but many of them are either time consuming to setup or aren’t really designed for your ‘everyman’ small business or organization. Enter HipChat, a startup that wants to be the communication platform that any business or organization can get up and running in a matter of minutes. The service launches today in private beta, and the first 100 people to enter “TECHCRUNCH” as their invite code will be able to start their own company networks (you only need one code to invite your entire company). HipChat offers an Adobe AIR client (compatible with Windows, Mac, and Linux) that lets you chat with your entire team at once, or hold more private discussions with select team members. It offers support for quick attachment sharing, notifications when you receive a message, and a searchable web archive for past messages. And perhaps most important: it’s very easy to get up and running, even for the most casual users. You don’t need your own company Email address, and the signup process takes all of three minutes. The app itself is slick. It runs in AIR (which I’m not typically a fan of) but it looks very clean and doesn’t come with that distinctly unnative you often wind up with on AIR. Chats are broken into different rooms — along with your companywide chat, you can invite other team members to join you in smaller groups, and you can mark them private if you’d like to restrict access. Now, businesses often have the same question about services like this: why not just use a group chat room on AIM or Skype? The answer is equally obvious. If that’s so practical, why aren’t you already doing it? It’s hard to overstate how much these services can help. At TechCrunch we rely heavily on TC50 winner Yammer for much of our internal communication. It’s amazing how reliant we’ve become on the service in such a short time — if Yammer goes down, we wind up turning to mass Email messages, which are hardly ideal. 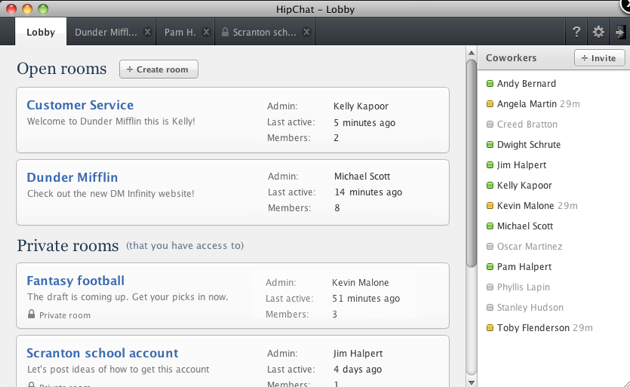 HipChat will be facing off with Yammer and, to some degree, Salesforce Chatter, but it’s tackling a different market. Yammer appeals to a huge variety of companies, but it requires that they have their own internal Email address (e.g. john@company.com). For small companies with limited tech resources, that’s a fairly high barrier to entry, which gives HipChat an opportunity. There’s also the potential to appeal to organizations like fraternities and clubs. HipChat also competes with Campfire by 37signals but Campfire is web-based rather than a desktop app. HipChat does have a ways to go from a functionality perspective before it can really match Yammer’s offerings. For one, there’s currently no way to receive a SMS notification when someone mentions you in a message. There are also no mobile applications currently available. HipChat also lacks some of the security options offered by Yammer, like restricting access to specified IP ranges, but for most small businesses that probably isn’t much of an issue. The HipChat team says that they’ll consider any good ideas its users request, so don’t be surprised if we see some of these features roll out soon. Users will be able to try the service free for thirty days, and then can step up to a paid plan, which range from $9 a month for 12 members and a restricted chat history to $100 a month for 100 members and unlimited chat history. More pricing details are here. 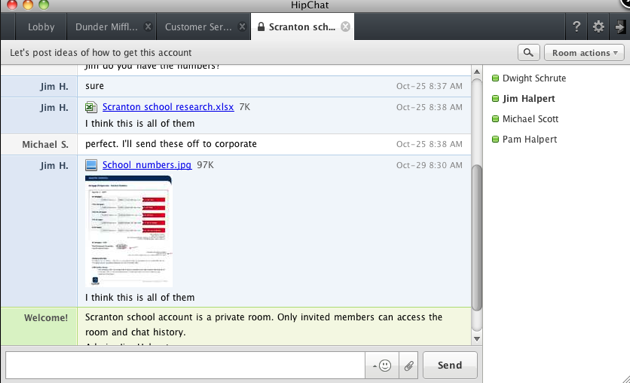 HipChat was founded by Garret Heaton, Pete Curley, Chris Rivers, who previously founded calendar startup HipCal, which was acquired by Plaxo in 2006. At Plaxo they helped build out Plaxo Pulse. They stayed at the company through its acquisition by Comcast in 2008, and left earlier this year to start HipChat. You can get a feel for HipChat in the demo video below. Clearly the HipChat team had a good time making it — make sure to pay attention to the The Office inspired chats (this is especially funny because Salesforce used the exact same idea for their demo).